Want more spring color in your garden? These flower combinations offer options for sun and shade. Do you carefully plan your garden on paper using information you gather about the plants you want to grow? Maybe you leave the design to chance, randomly setting out plants and allowing their seedlings to fill in the spaces. Perhaps a neighbor shares a start of something and you need to quickly get it back into the ground so you put it in the first available open spot. 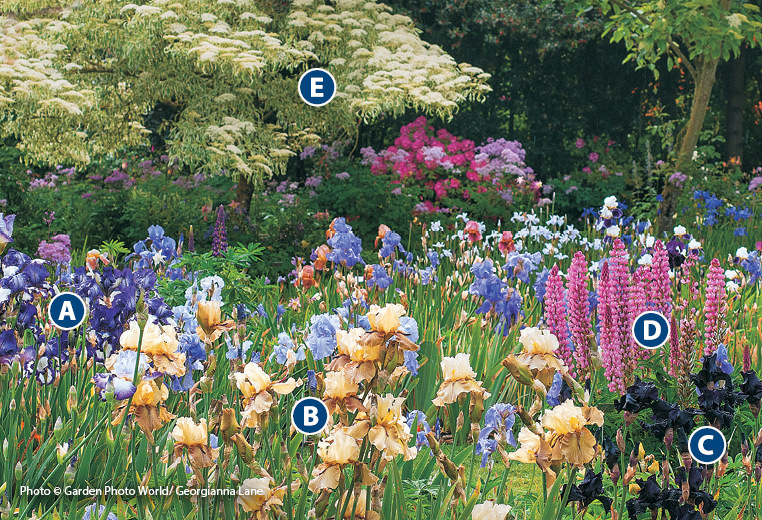 No matter how you plan your garden, combinations happen — some more pleasing than others. One of the best ways to get started creating a good combination is to choose a favorite plant. Next, think about its best season of interest: Spring, summer or fall. Then find another plant that needs similar growing conditions and peaks at, or about, the same time. Consider how the two will look next to each other. Do the colors of the blooms or leaves work well together? Is there an interesting foliage or flower shape contrast? And most importantly, do you like how they look? If you answer yes to these questions, odds are you’ve made a good combo. To complete a border or garden, pair more plants together that reach their high point of interest at different times of the year and plant them nearby. Soon you’ll have an entire bed that has something to draw your attention during every season. In the photos below you’ll find a few favorite spring-blooming perennials to help you get started. These two plants have several things in common that make them good companions. First, they bloom at the same time most years. Second, they both grow in part shade and moist woodland, or humusy, soil. Third, their flower colors are similar and the foliage contrast makes the pairing interesting even without blossoms. Finally, once planted, these plants can live for many years in the same spot and will multiply to form colonies. The trillium spreads by rhizomes and the checkered lily by seeds, with no help from you. That means you’ll have lots more of this combo to enjoy. 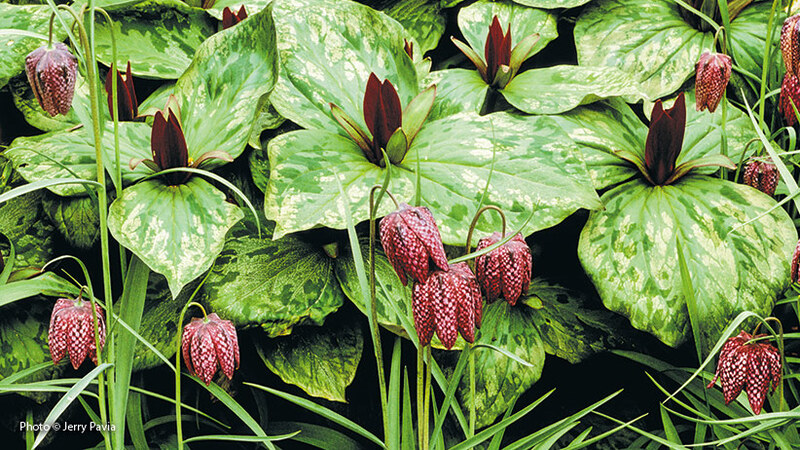 But these plants disappear by midsummer, so be sure to cover the spot with a later-emerging plant, such as hosta, so you don’t end up with bare areas in your garden. Bearded iris have been grown in gardens for generations. This classic perennial comes in nearly every shade of the rainbow except true red. And just as you see in the photo above, flower colors can be soft pastels or deep, rich jewel tones. There are hundreds, if not thousands, of named cultivars. But if you spot one you like in a friend’s garden, who cares what the name is! Odds are folks will share a rhizome or two when it’s time to divide in summer. All bearded irises bloom in spring. 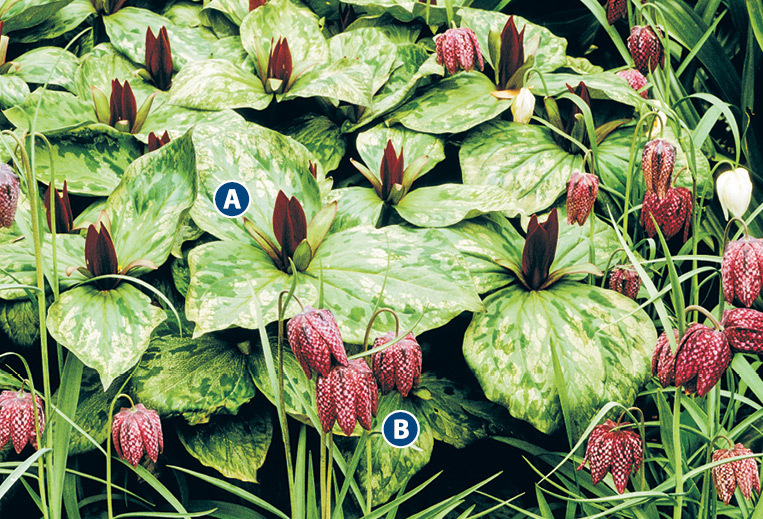 To get as many weeks of color as possible, choose early-, mid- and late-season varieties. While some cultivars do rebloom in fall, spring is when you’ll always get the best show. Find a spot in full sun with good drainage for bearded iris. This plant does best if the soil periodically dries out. Too much moisture can rot the roots or make the stems floppy. While a bed or border of one type of perennial can be striking, adding a few flowers of different shapes adds more interest. Notice how the bright pink spikes of lupine stand out in contrast to the iris flowers? Good combinations are as much about shape as they are about color.